I have an Irish heritage, but I also love watching the Simpsons. 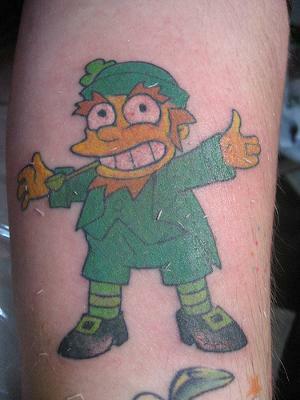 The first time I saw the character Grumpy the leprechaun, I knew that would be my next tattoo. My wife has a tattoo of Marge with baby Maggie, so there is a Simpson's theme. The tattoo is on my left arm on the underside. Every time I see my tattoo I remember my history and how funny the Simpson's are.